Towards Perth: Western Australian Women Artists Before 1950 is drawn from the Cruthers Collection of Women's Art and the University of Western Australia Art Collection. 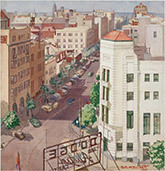 Artwork featured: Portia Bennett, Hotel Adelphi, Perth, 1948, watercolour and pencil on paper, 54 x 52cm. The University of Western Australia Art Collection. Gift of the Visual Arts Board of the Australia Council, 1986. © courtesy of the artist’s estate. Towards Perth presents works by seven esteemed artists in the early half of the 20th century, drawn from the Cruthers Collection of Women’s Art and the University of Western Australia Art Collection. It is often assumed that works by female artists from this era tend towards the ‘interior’, predominantly focused on domestic scenes, still-lives or portraits. Towards Perth offers a contrary view, a group of artists who looked to the city and the environment for inspiration, and who exhibit a direct concern with their changing, increasingly modern landscape. This exhibition features work from Jean Appleton, Portia Bennett, Elizabeth Blair Barber, Elise Blumann, Audrey Greenhalgh, Edith Trethowan and Rose Walker. A full list of works and the exhibition catalogue is available for download online.